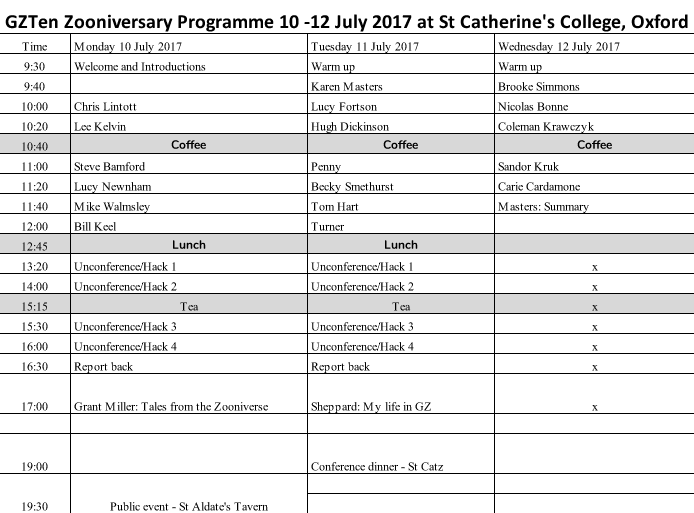 Galaxy Zoo is celebrating ten years since launch next month, and as part of the festivities the science team are having a meeting in Oxford from 10th-12th July. Unfortunately we didn’t think it was feasible to invite the hundreds of thousands of you from all over the world who have contributed to the project over the last ten years, but the good news is that all of the talks from the meeting will be interactively live-streamed so that anyone can join in the discussion! See the schedule above for details on who is speaking at the meeting. Details of how to join the live stream will be released closer to the event. There will also be an Oxford SciBar public event on the Monday night. All who are able to make it are welcome to join but don’t worry if you can’t, there will be a full podcast of the evening released shortly after the event! Some colleagues and I successfully proposed for a symposium on citizen science at the annual meeting of the American Association for the Advancement of Science (AAAS) in San Jose, CA in February 2015. (The AAAS is one of the world’s largest scientific societies and is the publisher of the Science journal.) Our session will be titled “Citizen Science from the Zooniverse: Cutting-Edge Research with 1 Million Scientists.” It refers to the more than one million volunteers participating in a variety of citizen science projects. This milestone was reached in February, and the Guardian and other news outlets reported on it. The Zooniverse began with Galaxy Zoo, which recently celebrated its seventh anniversary. Of course, Galaxy Zoo has been very successful, and it led to the development of a variety of citizen science projects coordinated by the Zooniverse in diverse fields such as biology, zoology, climate science, medicine, and astronomy. For example, projects include: Snapshot Serengeti, where people classify different animals caught in millions of camera trap images; Cell Slider, where they classify images of cancerous and ordinary cells and contribute to cancer research; Old Weather, where participants transcribe weather data from log books of Arctic exploration and research ships at sea between 1850 and 1950, thus contributing to climate model projections; and Whale FM, where they categorize the recorded sounds made by killer and pilot whales. And of course, in addition to Galaxy Zoo, there are numerous astronomy-related projects, such as Disk Detective, Planet Hunters, the Milky Way Project, and Space Warps. We haven’t confirmed all of the speakers for our AAAS session yet, but we plan to have six speakers who will introduce and present results from the Zooniverse, Galaxy Zoo, Snapshot Serengeti, Old Weather, Cell Slider, and Space Warps. I’m sure it will be exciting and we’re all looking forward to it! She's an Astronomer: Did we really need that series? A long time ago when I initiated the She’s an Astronomer series I came up with the idea that it would be nice to ask everyone the same questions so that we get a overview of what lots of different (female) astronomers thought about the same issues. I deliberately set up a range of questions to allow the interviewees to focus on both the positive aspects of being involved in astronomy (and particularly the wonderful science Galaxy Zoo does) as well as any negative aspects of being a female in a very male dominated group. and from our American friends at AAS, they provide a more recently updated table of Statistics which shows the encouraging statistic that in the US now about 40% of the PhD students are now women (but still only about 10% of permanent staff). Statistics on amateur astronomers are a bit harder to find. You’d think our own Zooite database would help, but unfortunately we don’t track that kind of information. From experience though (as a speaker) I know amateur astronomers are an extremely male dominated group and disappointingly there has been very little change in this over the last few decades. This article in Sky and Telescope (which incidentally pictures one of the professionals we interviewed – Prof. Meg Urry) celebrates the improvement in the numbers of professional women astronomers since the late 70s, but reports that the situation hasn’t changed nearly as much in amateur astronomy: “According to Sky & Telescope reader polls, in 1979 only 6 percent of subscribers were female. By 2002 that number had grown to [only?] 9 percent.” And thanks to my friends on Twitter I found more recent S&T reader demographics which lists only 5% female readers as of January 2010. So that’s very disappointing. And in case you think such figures are somehow S&T only, my friends at the Jodcast tell me their mid 2010 survey of listeners resulted in a figure of 14% women (consistent with 9% women from 2007 within statistical uncertainty). Also if you remember we interviewed 16 different women – which comprised all 8 of the professional astronomers (from students, to senior professor) who had been involved in Galaxy Zoo at that time, plus 8 of the Zooites. Hanny Van Arkel (Galaxy Zoo volunteer and finder of Hanny’s Voorwerp). Hanny’s interview in het Nederlands. Aida Berges (Galaxy Zoo volunteer – major irregular galaxy, asteroid and high velocity star finder). Entrevista de Aida en español. Julia Wilkinson (“jules”, Galaxy Zoo volunteer. Frequent forum poster.). Els Baeton (“ElisabethB”, Galaxy Zoo folunteer. Frequent forum poster, and member of most of the spin-off projects!). Els’s interview in het Nederlands. Dr. Vardha Nicola Bennert (researcher at UCSB involved in Hanny’s Voorwerp followup and the “peas” project). Vardha’s Interview auf Deutsch. Dr. Pamela L. Gay (astronomy researcher and communicator based at Southern Illinois University). I’ve been wondering for quite some time if the group agreed with each other on anything, and if we can come up with any interesting conclusions by looking at the different answers to each question. 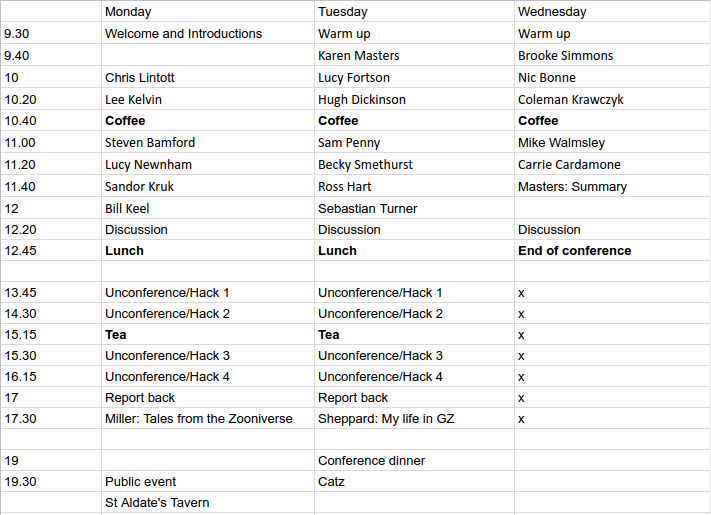 As some of you know I’ve been a bit distracted (little things like having a second baby, and getting some exciting Zoo2 results out), but I have now collated the answers to two of the most general questions (“What do you think is the most interesting astronomical question Galaxy Zoo will help to solve?” and “What (if any) do you think are the main barriers to women’s involvement in Astronomy?”) and plan to present my summary of the responses in upcoming blog posts. Here there was a lot of disagreement, but some interesting trends with the level of formal education/career progression in the field (unfortunately in the sense that there were more perceived problems the longer a person had worked in astronomy). For the most part the Zooites focussed on the problem of presenting science (to both girls and boys) as a boring/hard subject in schools (and to a lesser extent in the media). Our youngest interviewee, Hannah (who is working on her IGCSEs as a home schooled student) summarized the general view most clearly “because it’s taught so badly at school, it shuts down any interest”, and Alice (a science writer and former science teacher) agrees: “I think poor education is a far worse barrier than gender”. Gemma (a postgraduate student in engineering) muses that perhaps it’s because: “maths and science are [not] presented in an interesting way for girls at school and they are perceived as hard, rigid, dusty disciplines”. And Julia (an amateur astronomer with a degree in Economics) finishes it off by saying that she “think[s] that the media is partly to blame for propagating this myth by getting it badly wrong when presenting some science programmes and portraying maths as something we all hated at school”. There were some positive views from the Zooites though. Hanny (a Dutch school teacher) expressed a her view that if you’re determined enough you’ll make it: “I can’t think of something that would’ve stopped me to be honest”, and there was a view expressed by the volunteers with more life experience that things were improving with time, for example Julia says: “I think things have improved slightly since [I was at school] but the popular myth still exists that maths is hard and science is stuffy and boring” and Els (a secretary in Belgium) says: “as you can see with the Galaxy Zoo community there are lots of women involved of all ages and backgrounds. So I think we’re getting there, eventually.” Aida (a stay home Mom in Puerto Rico, originally from the Dominican Republic) agrees saying “now I see that the universities [in the Dominican Republic] are full of women studying and that makes me so proud. There are no barriers now for us”. However, another problem posed by the research career path is the balancing of duel careers, something which preferentially hits women scientists as I explained: “because of the current gender imbalance, a higher proportion of female scientists than male scientists are married to other scientists” and as I know from personal experience “the balancing of two careers as junior academics at the same time is something which is really very difficult and stressful”. Carie agrees: “there are numerous problems to consider if both partners are academics, a common situation for female astronomers”. Our most senior professional astronomers (our two Profs: Meg and Pamela) both have comments about the sometimes poor climate and the still prevalent (but usually subtle) discrimination. Pamela says that “I think a lot of academia is still very much an old boys network”, and describes examples of subtle discrimination which just make the women feel they don’t belong (for example “too few women’s bathrooms”, “equipment [..] designed for tall, flat chested, heavy object lifting men” etc.). Meg says that 30 years in the field have shown here that “Fewer women are sought after as speakers, assistant professors, prize winners, than men of comparable ability”. Going back to the school years, Zooite Julia says that “Girls just weren’t encouraged to take sciences”, and Aida recalls how when she was at school (in the Dominican Republic) “girls were supposed to marry young and be housewives”. And not to depress you further, but some of our 16 interviewees had some horrible stories of less subtle discrimination to share. Meg has “seen talented women ignored, overlooked, and sometimes denigrated to the point where they abandon their dreams”, Pamela recalls the common assumption that “since I’m in a physics department, [..] I must be a secretary”. And I remembered that “It was hard to be a teenage girl who was good at maths/science and I spent a lot of time learning to hide it”. From the Zooites, Alice mentioned Cecilia Payne-Gaposkin and Jocelyn Bell-Burnell who she comments were “both treated outrageously unfairly” and has some sad stories of her own to share too. And finally as encouragement for all the girls and women out there interested in astronomy as a career I’m going to reproduce almost the whole last paragraph of Meg’s answer with some helpful suggestions for getting around the problems which remain. So that’s why I thought we needed a blog series showcasing the women of Galaxy Zoo. Next time – all the fun science which after all is the reason we all tough it out when we have to! Hello Zoo-ites! I’m a work colleague of Kevin’s and I just recently submitted a Galaxy Zoo paper too. I just wanted to let you know all about it because I also wanted to thank you all for the great work which you’ve done in classifying so many galaxies. I am quite excited by the results and hope that it will be published soon. My research interests spans from understanding the processes of star formation to the evolution of galaxies and the Universe as we see today. The Galaxy Zoo paper that I just submitted consists of nearby galaxies which appear to be transitioning from being star-forming to passively-evolving galaxies. In particular, I looked at a sample of post-starburst galaxies (PSG). These PSG had a recent burst of star formation but they have since ceased forming stars. Thanks to the compilation of all the morphology classifications and the merger votes produced by the Zoo-ites, we were able to determine that most of these PSG have an indeterminate morphology with a higher fraction of interaction than regular spirals or ellipticals. It is possible that these interactions were responsible for the burst of star formation as well as the disturbed galaxy morphology. The majority of PSG are low-mass but most of their stellar distribution already resemble those of ellipticals. However, they are still somewhat “green” and will likely turn red once the starlight of the youngest population of stars start to fade. Therefore these nearby PSG will probably end up as redder, low-mass and more passively-evolving galaxies. This result agrees with previous works asserting that the most massive and passively-evolving galaxies were formed at earlier times in the history of the Universe. As I’ve spent most of the last month in the US, and I saw a request from Curtis when I last updated the Top 10 cities for the states most infiltrated by Zooites. I think we need to sort this by population, but in the meantime I can confirm for Adam – who asked the question – that there are indeed Zooites in Ulaan Baatar. Galaxy Zoo motivation study paper accepted! Our paper on the motivations of Galaxy Zoo users has been accepted for publication in the journal Astronomy Education Review! Now that the paper has been accepted, I have posted it on the arXiv system. Head on over and read it if you’re interested in hearing more about the interviews we did with some of you to learn what makes Galaxy Zoo appeal to you. I wrote a summary of the paper for this blog a while back, but now you can read the paper itself. The paper should appear in the Galaxy Zoo Library in the forum soon, and Pamela, Georgia, or I would be glad to answer any questions you have about the paper there. The next step in this research is to analyze the data from the survey that many of you took, and we’re working on that step now. Updates on that will come soon. Thanks to my lovely co-authors, and of course to all of you, without whom this none of this research would be possible!